“NEW YORK, NY, Jan 21, 2014 -- Patrizia the Sultry Lady of Jazz has been selected for the 2014 Best Jazz Vocalist by the Jazz Musician Association for the 4th year in a row. The Jazz Musician Association (JMA) "Best Jazz Vocalist" Award Program recognizes outstanding Musicians, throughout the country. Each year, they identify Musicians, they believe have achieved exceptional success in their category. These individuals that enhance the positive image through their Music, presentations and their positive personal image. Various sources of information were gathered and analyzed to choose the winners in each category. The Award Program focuses on vocal quality, diversity, performance,compositions and artistic direction. Patirizia's latest concert tour "Autumn in the Key of Jazz" was an outstanding body of work garnering her standing ovations at every performance. She kicked off the tour in San Diego,CA September 25, 2014. On April 25, 2014, she paid homage to Ella Fitzgerald, celebrating the 56th anniversary of Ella Fitzgerald's Birthday Concert in Rome, with a commemorative performance, leading the band was her pianist/music director, music Director, Ron Levy. The concert was held at Convivio Art and Cultural Center, in San Diego's historic Little Italy. The exciting program included Ella's original arrangements, by some of the greatest composers, George and Ira Gershwin, Richard Rogers and Lorenz Hart, Ella Fitzgerald, Irving Berlin, including Oh Lady Be Good, Bewitched, Bothered and Bewildered, A Tisket A Tasket to name a few. "The Essential Jazz Tribute" featuring In Concert Patrizia The Sultry Lady Of Jazz dubbed The Sultry Lady Of Jazz by her fans, always exploring and seeking to expand her creative horizons, back by popular demand, once again took the stage at Tango Del Rey in Pacific Beach, California Friday November 9, 2012 at 8:00pm. Tango Del Rey is pattened after the clubs in New York, LA & San Francisco, where she put on a mesmerizing performance, as all of her performances. Ladies Night Sultry Lady of Jazz Honors First Lady of Song copy of article available upon request. SAN DIEGO, CA- February 5, 2007 - Patrizia a San Diego based Jazz Vocalist and Recording Artist brought down the house at Humphrey's Backstage Lounge Saturday evening January 27, 2007 with an outstanding concert performance which launched the National Release of her debut album "ALL THE THINGS YOU ARE." Accompanied by a stellar group of muscians, Richard James, Daniel Jackson, Jeff Denson and Ronnie Stewart, Patrizia took the stage and captivated the sell out crowd with her beautiful vocal interpretations of several classic jazz standards from her debut album "ALL THE THINGS YOU ARE." The concert event was Mceed by San Diego's own J.Otis Willams of Ksds 88.3. The days festivites began with a personal appearance on Good Morning San Diego, Saturday morning, accompanied by Richard James, Daniel Jackson, Marshall Hawkins and Ronnie Stewart. performed I could write a Book, one of the tracks from the CD. This straight-ahead jazz album was recorded live on August 25, 2006. All of the compositions were chosen because of their extremely beautiful timeless music, and the emotional depth of the lyrics. Patrizia put together a stellar group of master musicians, consisting of Richard James on Piano, Daniel Jackson on Tenor-Sax, Bob Magnusson on Bass, and Ronnie Stewart on Drums. She calls them, "My Four Outstanding Sidemen." Each one knowing the role of their instrument so well, that even upon seeing the arrangements for the first time, the performances they deliver are truly outstanding. The album consists of an impressive collection of 12 Classic Jazz Standards and is being launched with concert performances, and interviews on radio and television programs. Patrizia is introducing the record via several intimate showcases followed by a tour planned for late spring. Patrizia allowed her sidemen to not merely be accompanists but fellow creators whose contributions take on the same importance as hers. It is this combined artistry, this ultimate mix, that makes this album impressive." "The the vocals are terrific, the background solid, and the recording quality is excellent. Great music to listen to, smile to, fall in love to, and dance too. Straight Ahead Jazz and the Great American Songbook are very alive and well in the able hands -- and wonderfully expressive voice -- of Patrizia, who has been appropriately dubbed The Sultry Lady of Jazz. Her splendid debut album of standards, All the Things You Are, captures the essence of such classics as "Blue Skies," "Willow Weep for Me," and the CD's title tune. Worth the price of admission is the set-concluding "Send in the Clowns," the emotional depths of which Patrizia plumbs to a fare-thee-well. This CD is more than a winner – it is a treasure ! The 3rd Annual Little Italy Carnevale presents Piazza Natale at Date & India Little Italy, San Diego 6-9pm. Patrizia will be providing Straight Ahead Jazz at the Piazza Natale at Date & India for the 3rd Annual Little Italy Carnevale a mirrored event of the great festival held in Venice each year. Patrizia a popular San Diego based vocalist is gifted with a beautiful rich soulful voice, which is warm and radiant, impressive in it's range,which is both powerful, but delicately serene. She subtly controls the quality of her voice to aid her as she takes you on an enchanting musical journey as she tells the story. Her elegance, will remind you of Ella Fitzgerald, her vibrato of Billie Holiday, emotional depth of Carmen McRae,her sassiness and vocal quality control will remind you of Sarah Vaughan. She will be accompanied by her pianist Alan Zundelevich a Latin American Jazz pianist, composer and arranger. Alan Zundelevich has been captivating audiences all over the world with his edgy and unique style. His jagged Latin rhythms, Straight Ahead Jazz Standards, intense playing, deep imagination and closeness to the listener, making his music a real journey into adventure. His music is a multicultural blend of diverse cultural traditions and the newest of trends. This is truly an evening not to be missed. The 3rd Annual Little Italy Carnevale is a tribute to the great festival held in Venice each year, weeks before Ash Wednesday. This significant Northern Italian event displays the richness and history behind the costumes and masks that have made this annual event world famous. In our personal way, the merchants of Little Italy - San Diego will sponsor an evening celebration honoring Italian culture a half-world away. We encourage the attendees to fashion costume, which is befitting of the Carnevale in Venice and join us for a costume competition at the main stage (Piazza Basilone - India & Fir) and regale all the participating shops as well. This one-day event will be celebrated on Saturday evening (5:00pm to 9:00pm), February 25th at various Piazzas and shops in Little Italy on India, Columbia and various side streets. The community will offer various venues of entertainment as well as merchants who will display their merchandise in honor of the Carnevale festivities. The Main Stage will be located at the Piazza Basilone, corner of India and Fir Streets. Throughout the evening additional entertainment will be found at the Piazza Villaggio (Beech & India), Piazza Jacaranda (Cedar & India), Piazza Natale (Date & India) and other small vignettes. PATRIZIA...The Sultry Lady Of Jazz to perform at Carnevale! San Diego, CA February 25, 2006 -PATRIZIA...The Sultry Lady of Jazz is back by popular demand to perform at the 3rd Annual Little Italy Carnevale at the Piazza Natale on Date & India February 25, 2006 6pm to 9pm. PATRIZIA will be performing carefully selected compositions from her vast repertoire of great american songs, reminiscent of the Sinatra era which have been arranged specifically for her. PATRIZIA is a very talented vocalist with a warm, soulful, radiantly powerful voice, yet delicately serene with an impressive 4 1/2 octave range. As she sings she becomes one with her audience developing an artistic and symbiotic relationship with her audience as she controls the quality of her voice to aid her as she takes you on an enchanting musical journey as she tells the story. Her elegance, will remind you of Ella Fitzgerald, her vibrato of Billie Holiday, emotional depth of Carmen McRae, her sassiness and vocal quality control will remind you of Sarah Vaughan, although her voice is truly her own with a unique quality all it's own. Alan Zundelevich a Latin American Jazz pianist, composer and arranger, recently relocated to the San Diego and joined forces with Patrizia. Alan Zundelevich, has been captivating audiences all over the world with his edgy and unique style. His jagged Latin rhythms, Straight Ahead Jazz Standards, intense playing, deep imagination and closeness to the listener, making his music a real journey into adventure. He is truly a multicultural blend of diverse cultural traditions and the newest of trends. The Carnevale a mirrored event of the great festival held in Venice each year. They welcome you to fashion a costume, which is befitting of the Carnevale in Venice and regale them with your mask, gowns and suits. There will also be a costume contest with prizes. Be sure to prepare yours for a night of fun-filled entertainment, shopping and dinning, it will be like you have been transported into an 18th-century Canaletto painting. Friday, September 30, 2005 at 8pm Mayer Roofing and Avante Garde are pleased to present PATRIZIA... The Sultry Lady of Jazz at the Velvet Lounge on the Roof. Traditionally an event offered by invitation only, Avante Garde is thrilled to extend the opportunity to the public to witness the performance of such a high caliber entertainer without having to drive to one of our neighboring big cities. PATRIZIA a popular San Diego based vocalist gifted with a beautiful voice, which is warm and radiant, impressive in it's range. She has an impeccable sophisticated rhythmic sense, perfect intonation. Her rich soulful voice is powerful but delicately serene. She subtly controls the quality of her voice to aid the interpretation of a song, juxtaposing phrases sung in a soft delicate, warm tone with others in a throaty growl allowing you to feel her passion as she takes you on a enchanting musical journey telling her story. Her flawless harmonic sensibility and intonation along with her elegance, will remind you of Ella Fitzgerald, her vibrato of Billie Holiday, her sassiness and vocal quality control of Sarah Vaughan. Please contact the museum at (951) 684-7111 or dkraemer@riversideartmuseum.org for ticket and/or museum membership inquiries. PATRIZIA... 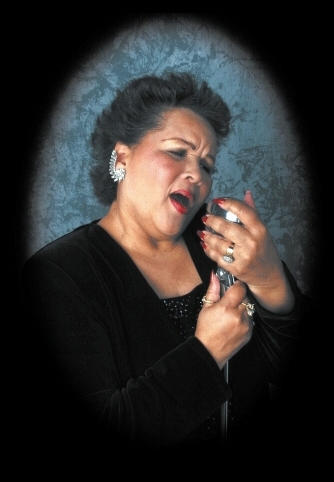 The Sultry Lady of Jazz coming to Riverside Art Museum Friday, September 30, 2005 at 8pm PATRIZIA... The Sultry Lady of Jazz known for her stylish interpretations of Jazz ballads, takes the stage atop the Riverside Art Museum which features stunning panoramic views of Riverside for their annual jazz fundraiser benefiting the museums education programming. This event is always a sell out. But this year with PATRIZIA and her Jazz Quartet taking the stage an even quicker sell out is expected. or dkraemer@riversideartmuseum.org for ticket and/or museum membership inquiries. THINGS 3425 Misson Inn Ave. Tickets are $50 via phone, e -mail for nonmuseum members and go on sale Sept 17. This Saturday at 8 p.m., the Iconnect Cafe is proud to host an evening with Patrizia, a popular San Diego-based vocalist. Known to many in the San Diego community as the "Sultry Lady of Jazz," PATRIZIA will present a program of carefully selected material drawn from her vast performance repertoire. Saturday evening's event promises plenty of music and fun for all in an intimate atmosphere. "Jazz vocalist sings at Iconnect Cafe"
"Vista--Patrizia, a San Diego jazz/blues vocalist known as "The Sultry Lady of Jazz," will perform three shows of jazz standards and blues beginning at 7:30pm, today at Iconnect Cafe, 201 E. Broadway in Vista." "The daughter of a surgeon who moonlighted as a jazzman, Patrizia has toured the country with her jazz ensemble and counts Sarah Vaughan, Ella Fitzgerald and Billie Holiday among her musical influences." "Welcome back Patrizia, glad to see you back singing after your accident, you were missed! "You're an outrageous singer! Congratulations on your success!"